A big part of what makes Second Life so appealing for me is the ability to meet and interact with interesting people from all over the world. I’ve been in Second Life for over a year now and in this time I’ve made some great friends with whom I love to discover new places in SL, have great serendipity moments or attend various events with. And we use a lot of different tools to keep in touch - mainly Twitter and Facebook. But I often wished for an easier way to let my SL friends know about a great event going on or a great place I’m just visiting… and that is why I was really excited to discover a new Second Life tool last week called metaHUD. metaHUD is a HUD (Head-Up Display) that you can wear in Second Life. 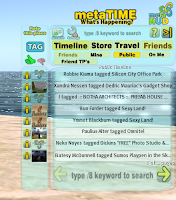 The developers of metaHUD like to describe it as a social networking platform for Second Life that enables Second Life residents to share their Second Life with friends. It can also be used only as a search engine for SL places and products and as a shopping tool, but its real power is in allowing residents to follow and use what their friends are doing. Let’s see how this is done through different parts of the HUD. When you’re wearing the metaHUD, it keeps track of your teleport history and other activities, and stores all that into your personal Timeline. Whenever you teleport to a new place, you can rate it by simply choosing a green thumbs up or red thumbs down button. If you wish, you can also tag the place to make it easier for other metaLIFE users to find it through keyword search, and you can even leave a comment about the place. If you really like the place, you can also add it to your Favorites (works similarly as the “Picks” tab in standard SL profiles). Next, the metaHUD offers the ability to search for people. If your friends use metaHUD, you can view their Timeline, Favorites, Home location, choose to follow that person (if you follow a person, you have their updates in the Friends Timeline), and even add tags and comments to their metaHUD profile. 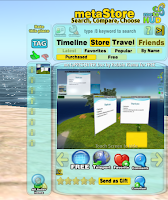 The Timeline feature is very similar to the Facebook Mini-Feed that tells you what a friend of yours has been doing on FB - in the metaHUD the Timeline tells you what a friend has been doing in SL. Also, the ability to add comments is similar to the FB wall feature. 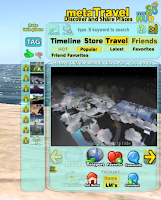 So basically, we can now have some of the useful features of web social networking sites within Second Life! Now, if you’re a Twitterholic like me you might wonder whether there’s also a way to post your status to friends. Well, you don’t have a separate place in the metaHUD to answer the question What are you doing?, but what you can do is add comments to places you’re visiting - and that appears in your metaHUD Timeline, so friends can easily read a comment that says “There is a great concert going on in this place!”. Of course, not always the best solutions, but when I talked about this with Robbie Kiama (one of the developers), he told me that they are planning to make a RSS feed from your Timeline and add better connectivity with Twitter and similar services, which is something I’m really looking forward to! 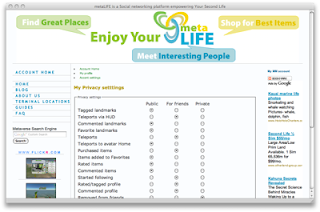 And let’s not forget that the metaHUD also lets you use the metaLIFE Meta Mart shopping system, which enables you to browse items in the Meta Mart system that are for sale (apart form an alphabetical list you also have lists of Latest, Favorite, Popular, Purchased and Free items), search for items using keywords, rate and comment virtual items (thus making it easier for other user to find good content), and you can also buy items directly from the HUD itself. Kind of what you can do on SL Exchange or Onrez, but without having to switch back and forth between the SL viewer and your browser. The shopping feature is of course very handy, and it even allows you to teleport to the actual store if you want to (something I personally miss on the web shopping sites!) and even send items as a gift to friends. If you’re a content creator, you can find more info on how to sell your items through the Meta Mart system on this page. There is also a paid Referring Partner system that can earn you some L$, but I personally haven’t tried it yet. And finally, the metaHUD also generates a personal password for you, which can be used to sing in to the meta-LIFE.net site. Here you can manage your metaHUD profile and items (if you’re selling your objects through the metaHUD Store), and manage your metaHUD privacy settings, so you get to decide whether your teleport info, shop history, and other actions are visible to all metaHUD users, your friends only or nobody but you. doesn’t obstruct your view too much when minimized. added support for events (the ability to announce events and sign up for events). But all in all I think the metaHUD is a great product that finally brings some Web 2.0 in-world. I’ll certainly be keeping an eye on the metaLIFE team for future projects, as they really have some great ideas. Yesterday they also released metaPRESENTER, a presentation screen for SL that is controlled through a HUD. Pretty neat! You can of course get your free metaPRESNTER through the metaHUD, which you can pick up at the in-world Meta Mart location. And please, do feel free to leave a comment under this post with you opinion about the metaHUD, I’d love to hear what you think about it!